Still working through the Stoke City / Columbus Crew match... Now, keeping in mind that I'm six and a half feet tall, one thing that struck me was the size of Stoke players. It's something that you hear all year long watching the club but seeing them live was impressive. 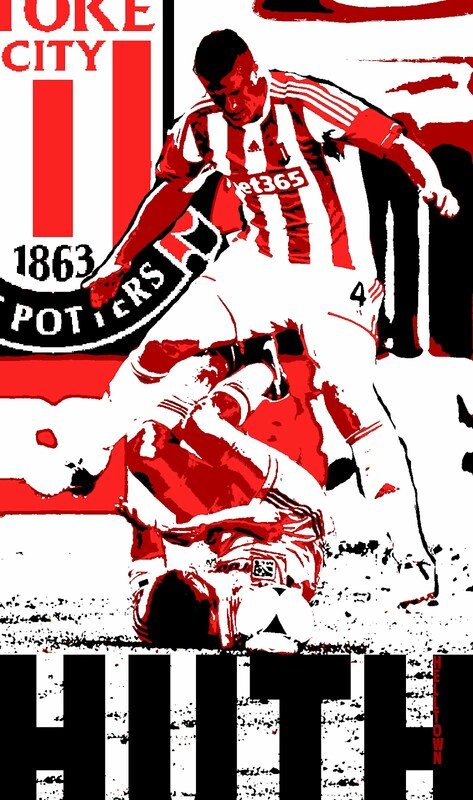 I think it was Ryan Shawcross that pulled Josh Williams (listed at 6'2" 192 lbs) backwards on a corner so hard that his legs flipped up as if he was doing a bicycle kick. Matt (mossrobot, go there) mentioned in an email exchange that he was "surprised Shawcross didn't get a red card." I'm surprised as well. That statement could follow just about every Stoke game for me, I guess. Tony Pulis has these guys programmed such that, when they foul... you know it. I've been messing around with 8-bit inspired stuff for some time now. This particular photo stuck me as one to go with. Robert Huth is huge, big like an end boss on some forgotten Sega Master System game. So this felt natural enough. I just didn't go full 8-bit with it (using GIMP). I've always thought that Eddie Gaven had the tools to play just about where ever he wanted if he (and his agent?) were ambitious enough. During the Stoke friendly he was very active and looked very comfortable. Part of me wants to believe that he wanted to spark the interest of Stoke. Eddie only played in the first half but he found himself in excellent spots. He's often overlooked because of his demeanor but against Stoke he looked inspired. Make no mistake. Eddie Gaven is the shinning gem on this club. He is at the peak of his powers and will be for a few more years. I'll know all I need to know about you if you don't list Eddie amongst the best. Not just on the Columbus Crew but in Major League Soccer. This illustration has him at the feet of a massive Robert Huth. That seems to run a bit contrary to what I've written here about Eddie but in a strange way fitting. A rusty but full strength Stoke side controlled the first 45 of this match. It could have easily been 2 or 3-0 at the half but it wasn't. All of the Crew side played hard. I don't know, somehow this illustration tries to capture what Columbus ran up against over and over. But you know what? They didn't stop running up against Stoke and their giants. The got up and tried again, again and again. - Robert Warzycha, during a moment of unusual clarity after the Stoke City friendly. It's exactly the type of approach you better take going up against Stoke. Preseason or not.